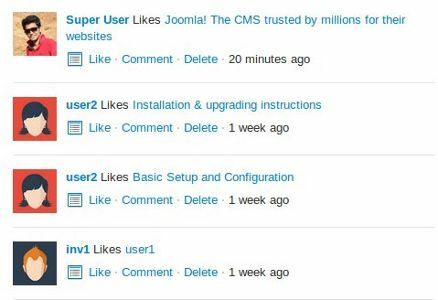 Likes, Dislikes, User Notes and like/ favourite lists for Joomla! Adds like and dislike functionality to a variety of content. Members can also add notes to each of their likes and put them into Lists - similar to GMail labels. jLike lets you add like and dislike functionality to a variety of content in your Joomla site. Plus users can also add personal notes against the content and add it to their own Like lists for better organisation. From a simple, likes system to a having your own internal social bookmarking system like Digg, Stumble Upon or Delicious, jLike can do it all for you! jLike supports 20+ popular Joomla extensions and is super easy to customise any per your needs with easy to choose themes or use the icon set for even more flexibility! 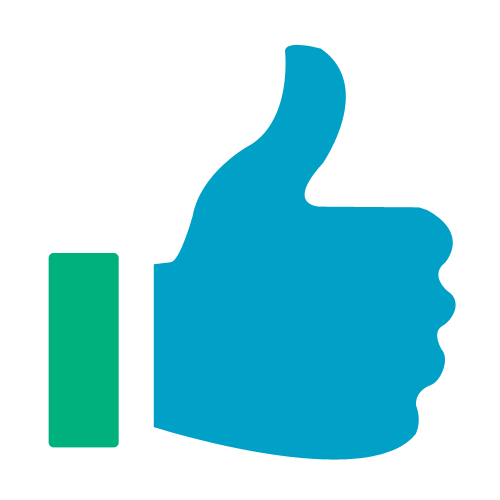 With an Awesome dashboard for site like activity, modules to show recent and most likes and an awsome developer API, jLike is the greatest likes/ favourites/ bookmarking extension for Joomla! Likes and Dislikes Or Call It Favorites Or Bookmarks! Add a consistent like/dislike all over your site for a variety of content like Joomla articles, news posts, photos, videos and much more! Users can like content with just a single click! jLIke has commenting users can comment and express their views to do that in a better way we’ve added emoticons to comments. Like and Dislike Buttons are added, this is for comments specific likes and dislikes. Can see people who see people who liked or disliked in a different tab. Well sometimes we feel like replying to a particular comment. Users have given liberty to give reply to a specific comments, reply tab is added to all the comments. Admin can set a limit to number of replies to an individual comment from the backend. If a comment is too long due to which less content of the page is visible at a glance, admin can set a character limit from the backend and if the comments exceeds the character limit “see more” tab will be displayed. User can conveniently arrange and sort the comments in such a way that the latest will be shown at the top and the oldest at the bottom or vice-a-versa. Choose the theme that best suits your site or customise to any level you want, using classes to change icons using the included Font Awesome icons. Plus you can rename the text and use jLike in any way you want.. As a likes dislikes system, Favourites or Bookmarks system! Its so flexible that we have one client using it with a Zoo and Quick2Cart as a wishlist! Joomla Content Category specific Likes, Dislikes and commenting. 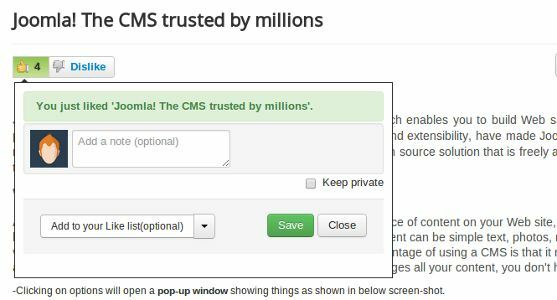 If the Admin wants to keep likes, dislikes and commenting limited for a specific Joomla content category that can be done from the backend. Get your users great visibility by showing 'People who liked' against the content just like Facebook. We can fetch your user's avatars from Gravtar, JomSocial or CB as per your choice too. Turn on this feature and users will be able to add Labels to content or in other words add your content to 'Like Lists'. This is an awesome way to let users organise their likes. Get notified about people liking, disliking, adding a comment and replying on your content and stay updated. On some websites there are abusive comments, spam in comments etc. Admin can avoid this on his site as admin can edit/delete comments from the backend and keep your site clean. This feature will allow users to add a quick note against any link they like. This note or annotation can be private or you can set it to public and it will be more like a comment. This gets our implementation of Like much closer to Facebook and adds some more Zing on top! Note that public display of notes as comments against content is not enabled yet. All extra features can be switched on or off as per your requirement. Whether you want a Vanilla likes system or a full featured one is completely under your control! 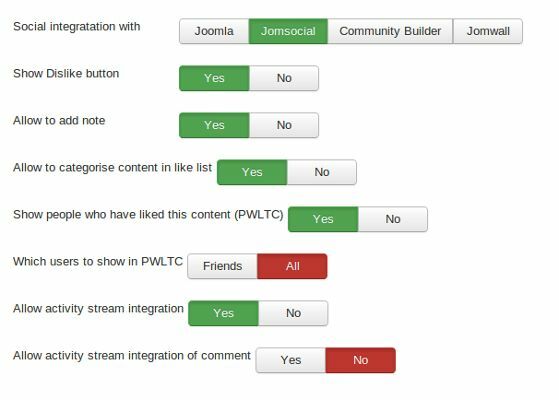 Push any like / dislike actions to the Community Builder or JomSocial Activity Stream and make your content go Viral! Plus if you have our Broadcast integration, you can also sync these updates with Facebook, Twitter & LinkedIn with Broadcast's Activity sync feature. Activity Stream, Avatar and notifications for commenting and likes, this is how jLike 1.1 is integrated with EasySocial. This awesome view lets you show an awesome line chart showing your site's like and dislike activities. Plus it also lists your site's like content and users can filter it by content type too! We’ve added likes, dislikes comments tab to show the exact number plus unique users tab. No page reloads after commenting. As commenting is now ajaxed and super fast. Users get their own Like View where they can see all the content that they have liked and added notes to in one place. They can also use their Like Lists to filter content to specific lists and content types. Lots and Lots Of Integrations ! Like ships with 20+ inbuilt integrations for various extensions including all popular CCKs, Joomla Content, Popular Shops, Galleries and much more. Here's a list! -Maximum number of characters allowed in a comment. jLike is written in native Joomla MVC and has lots of inbuilt plugin triggers to let you override and extend as much as you would like to. 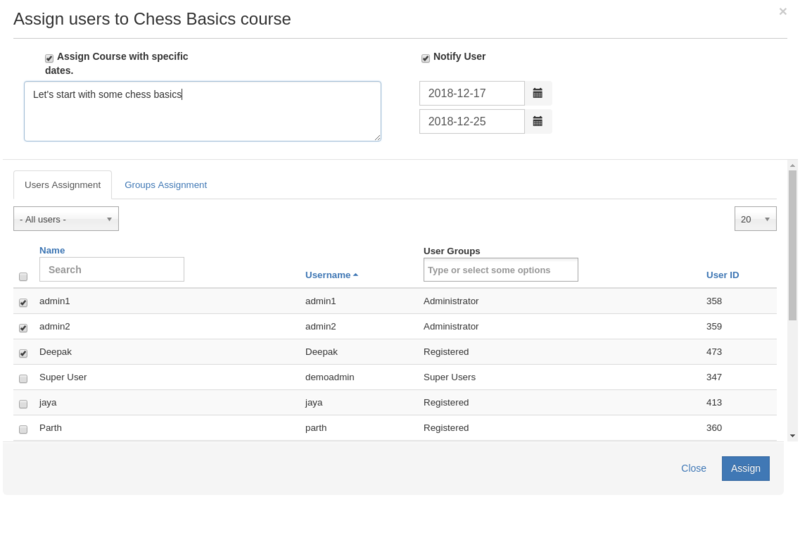 Using the jLike integration, the site administrator can assign the Shika course/Joomla articles to the user. 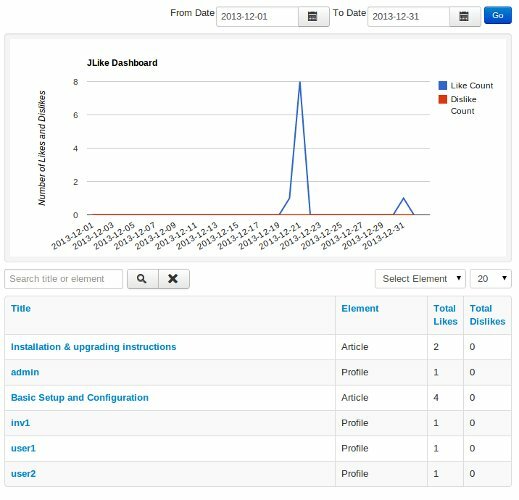 Using the jLike integration, the site administrator can recommend the Shika course/Joomla articles to the user.